This Bulk Pack Of Mini Bubble Star Wands Is The #1 Party Favor! They Are Perfect For Birthday Parties, Neon Themed Parties, Carnival Prizes Or Just Outdoor Fun. The Pack Contains 40 4" Bubble Tubes, 8 Of Each Color. The Tubes Are Pre-Filled With 0.16-Oz. Of Non-Toxic Bubble Soap. Use These In The Summer Days And Be Entertained For Hours. You Can Even Take Them Along With You On Trips/ Vacation With The Convenient Handle Attached To The Plastic Bucket. 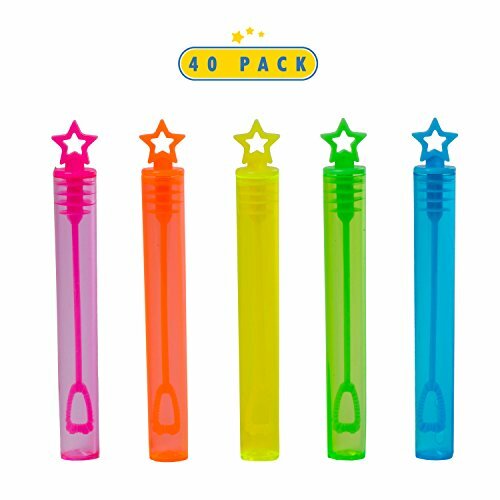 #1 KIDS FAVOR: Bulk pack of mini bubble star wands; 40 Pieces; Ideal Party favor, Carnival Prize, Outdoor activity, reunion fun for kids. MINI NEON COLOR Each Bubble Wand Measures 4", Small Enough To Fit Into Your Favor/Goody Bag But Big Enough For The Little Children's' Hands. Includes 8 Of Each Color. SUMMER FUN With These Bubbles You Will Upgrade Any Kids Party, Carnival, Trip, Or Gathering. They Are Great Favors, Fun In The Nice Weather And Entertaining For Hours. PRE-FILLED NON-TOXIC Each 0.16-Oz. Tube Comes Prefilled With Non-Toxic Bubble Soap Liquid. If you have any questions about this product by Toyrifik, contact us by completing and submitting the form below. If you are looking for a specif part number, please include it with your message.